I've held back this review for more than a year, not because the number at the top is controversial, but because I wanted it to be right. I think when you start a whiskey collection it is done for love of the spirit and not pursuit of perfection, but when those two align it is a thing of beauty. I purchased this bottle after my discovery of near perfection in Gooderham & Worts Naturally Small Batch Lot 4. In my review of that bottle I stated with a real belief that asking for more in a whiskey would be like Icarus wanting to fly closer to the sun. Wiser's 18 takes me into a stellar nursery. Stars burst into life all around me while Icarus looks up with envy, his fragile wings confined to low atmospheric flight. I've consumed about 75% of the bottle over the past year and it has not changed. It is perfect. Nose: Christmas! Evergreen pine, gingerbread, sugarplum and chocolate candies. Letting the glass open up reveals an apple pie before it has been baked - crisp and freshly sliced apples, cinnamon, and freshly made dough. Taste: Taste is the wrong word here. This whiskey is a journey. You do not taste it, instead you experience it. I take a sip and time stops. There is no liquid, only imaginary objects that take the form of old memories and tangible objects. In my minds eye there is a canoe hewn from a mighty oak. I board and begin to paddle, but there is an anchor that keeps me centered. The shore disappears and I look out on the boundless sea and spy a bottle bobbing in the currents. Inside is a list of flavors: Coffee, rye, anise, and pear. I look out again and there are now bottles too numerous to count surrounding me. Each contains a different list. The depth here is phenomenal. I have spent hours with a single dram. Finish: The finish is dry for a whiskey. It begs you to take another sip and savor the flavors as long as possible. The ocean drains. Bottles now litter the dry and cracked ground. Balance: This stuff is damn good. Nothing is out of place because the depth of this whisky is incomprehensible. If there is a flaw it is that there is no consistency. My experience is different every time and yet it is always flawless. The whisky bends and conforms to your every desire. Every sip is a new adventure. Final Thoughts: Jim Murray described his experience with Wiser's Legacy as being a young man in the wanting hands of an older vixen. Wiser's 18 reverses those roles. The whiskey is a flawless young yoga instructor. The way she bends with slow grace and precision fills my head with thoughts not suitable for a whiskey site. Incredible. Disclaimer: I've seen from plenty of reviews that Wiser's 18 is subject to batch and even bottle variation. This review is for this bottle and it is my sincere wish that there are others out there like it. The only identifying mark is that this is from case 789 of 2000. A beautifully written review for a magnificent offering. I've taken that yoga class, damn near killed me. There is no doubt in my mind this batch is from 2010 (L10). The Domestic version was marked as 3500 cases. The Export version, which you possibly have is from a smaller batch of the same vintage; I think it was 2000 cases. I've opened a few from this Lot, both domestic and export (thank you @StevieC), they are stunning examples of Canadian whisky making at its finest. A high mark, but I know how good this stuff can be...and it raises the question, "how good would this be at 45 or 46% abv? @newreverie, L10 263 was a stunner (export), as was L10 260 (domestic) both from the same bottling line 51SL6....I think there is only one line. Crown Royal Reserve (Special Reserve for export) was also amazing around the same time period 2009 - 2010. We will be drinking some primo juice in New Mexico come September. Wiser's 18 Year Old is a classic Canadian whisky somewhat notorious in some circles for batch variation. I wrote a review some years ago on a previous batch (which was quite nice), and this is a different batch (the previous had 3500 bottles, and this one only has 3400 bottles). The bottle code stamped on the back of the bottle is L140062204B. This whisky is a bit notorious for batch variation, especially given the price. This was from a decent batch. I recently reviewed another batch (which wasn't as good) from 2014 which was worse. This batch was out of 3500 bottles. This whisky, like other Wiser's whiskies, is distilled in Windsor at the Hiram Walker distillery. Weighting the nose 25%, taste 35%, Finish 15%, and Intrigue 25% the overall grade is 91. Glad to hear that there are good batches of Wiser's 18. I have never been so angry from buying a bottle as I have been from my bottle of Wiser's 18 yo. Beam's Red Stag whiskey liqueur tastes better for 1/4 the price. I am re-tasting from my 3 years open bottle of 2011 Wiser's 18 yo now. It has lost a lot of flavour recently, which, for this bottle is a good thing. Remarkably, old and toned down, this bottle of Wiser's 18 yo tastes much like Wiser's de Luxe, the most basic Wiser's expression, which, for this bottle is a step up. Old de-glopified Wiser's de Luxe, that's what I own now! I have tasted better Wiser's 18 yo than my own bottle of it, so I don't doubt that better batches are out there. A 91 pt Wiser's 18 yo? THAT I would have to taste to believe. Yeah - I have had bad batches - but no horrible batches that I would put below Deluxe. The recent batch I just had (from 2014) I rated at 87, though it was a fast review and I need to spend a bit more time with it. But, it was decent - not worth the money at that point but this bottle above was. From a Cigar smoker / Proud Canadian's perspective I enjoy a sweeter whiskey with my cigars with little bite as my cigar provides the bite and Wisers 18yr limited release has been my favourite so far. It was a risk buying an expensive bottle of whiskey with limited knowledge of whiskeys, but I have heard that this one was one of he best. Wisers 18 did not disappoint and I am hoping that it will act as a benchmark of quality. Upon first opening it the aroma from the cork was divine with hints of vanilla and caramel and slight oak. I first poured it over two ice cubes and let the water introduce itself. I was surprised that I could drink it straight without adding ginger ale or coke as the taste was soft with hints of vanilla and caramel which matched the bouquet perfectly. The aftertaste is clean and didnt burn or taste like rubbing alcohol. I highly recommend this whiskey and think it is a great pairing with a fine cigar. And now we come to my third and final Canada Day review. I opened this bottle of Wiser's 18 with my friends @thecyclingyogi, @kvass1970 and Ross (who I'm not sure is on connosr) in celebration of Canada Day! Wiser's has a long history of distilling in Canada, and was possibly the first distiller to use the words "Canadian Whisky" on the label, at the 1893 Chicago World's Fair. All of Wiser's expressions are distilled at the Hiram Walker distillery, which is owned by Pernod Ricard. Today Wiser's are the fifth best-selling Canadian whiskies in Canada and, in my opinion, Wiser's Legacy is the top Canadian whisky in the land. The 18 has a cloudy copper colour; the nose, lots of caramel, oak and musty rye. There is a little of the candy floss I've detected in Wiser's Legacy. Cigar box, burnt sugar, apples and raisins. Water really brings out a lot of vanilla. Very nice and oaky. The palate is absolutely fantastic. Very sharp, musty rye but really coated in smooth, velvety caramel. Cedar and ground black pepper. Water makes things creamier and adds more butterscotch. There is a lot going on in the mouth - it's spicy, sweet, smooth and sharp all at the same time. The finish is long and smokier than sweet. This is perhaps the richest and oakiest Canadian whisky I can remember, more so than even the CC 20 or the Alberta 30, which is not a bad thing. I'm giving this the same score I gave the Legacy, though I think I prefer the Legacy by a hair, only because the oakiness of the 18 starts to get to me over time. I think if I reviewed the Legacy now I would likely score it a touch higher; but it's hard for me to knock the 18 lower than 90, it is a truly rich, complex and deeply satisfying whisky. Well, I was thinking of doing a Happy Canada Day Part IV - my Glenora Battle Of The Glen came in today - but on second thought, I think I'll cap it at the three. Perhaps I'll save the Glenora for 2013! The reviewed bottle is # 0947 of 3500. All of Wiser's whiskies are distilled at the Hiram Walker & Sons Distillery in Windsor, Ontario. Nose: sweet, fruity, as from wine finish or additives, some old oak present, and some spiciness, apparently from rye. This is mostly quite pleasant and would be quite a good nose except that there is also some industrial chemical smell here as well. Taste: Very sweet, very fruity immediately. Unfortunately there is some unpleasant chemical taste also in the mix. There is significant sharply defined wood here, and definitely signficant sharply defined spice, tasting like rye, but the sweet fruitiness overpowers those flavours. Finish: very sweet, very long, and unfortunately rather cloying. Balance: I have been sampling this bottle repeatedly over 6 weeks time. At first I was furious with myself that I had bought it, because even though this has been aged 18 years, the sweet fruitiness here is way over the top, and is definitely not sufficiently balanced by an adequate level of wood flavours, spicy grain flavours, or alcohol astringency. This has significant spice and wood flavours, just not enough to balance the ridiculous level of sweetness offered. Worst of all this tastes to me to not have its sweetness come naturally from the wood, but instead to be the product of sweet additives. And then there is that chemical flavour lingering to accompany the good natural flavours. I like this a good deal better now than I did during my first 4-5 tastings of it the first week after I opened it. Still, this could be a much much better whisky if they would only tone down the fruity sweetness and get rid of those chemical overtones. Are there variations from bottle to bottle? Yes, there are variations from bottle to bottle, and sometimes those variations are very significant. I sampled some drams last night from a friend's bottle of Wiser's 18 yo which I liked much better than I like my own bottle of it. I would rate his bottle at 87/100. It was more focused, less overpoweringly sweet, less artificial tasting in its sweetness and not cloying in its sweetness, compared to mine. I would be happy to have my bottle taste just like that one. Sampled right now, my bottle is still too sweet for my taste, and the cloying quality is still there. The chemical/artificial element has diminished, so it has improved a little, now that the bottle has been open for about 5 months. Right now, I would give my reviewed bottle, above, a rating of 80. I only get cravings to drink from it out of curiosity to remind myself of its taste, and to continue to observe it for further migration in its flavours now that the bottle has been opened. I would be delighted if additional time would make its flavours more like my friend's bottle. 14 1/2 months of open-bottle oxidation later, this bottle of Wiser's 18 has lost most of its chemical flavours and some of its over-sweety cloying grapiness. I'd rate this bottle now at 82, something definitely to be enjoyed from time to time. I would still never buy another bottle of this whisky, though. Expensive, disappointing, cloying, and not in the same galaxy with Wiser's Legacy. I could not agree more with the previous reviewer's assessment. This is surely one of the best buys in high quality whisky. 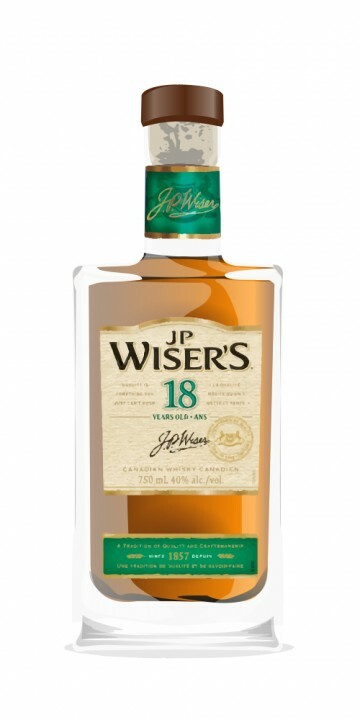 Recently Wiser's released their Legacy offering which has no indication of age but is selling for over $30 more a bottle in Ontario then the 18. It is clearly a lesser whisky. Canadian whiskey is light by design, and should not be judged among other whiskey types, such as bourbon, Irish or Scotch. Canadian whiskey is usually blended, and begins with a very light and fairly neutral corn base, to which a very small amount of flavoring grain whiskey, such as rye, is added. Later the whiskey can be matured in any type of cask they choose … but often these are used bourbon barrels. Wiser’s 18 is blended Canadian whiskey, that is aged for a staggering 18 years … quite long for this type of whiskey, and interesting to taste this extended aging result on such a light blend to begin with. Unfortunately not much more information is readily available from the distiller, other than their recommendation that it be enjoyed sipped. Other Wiser expressions are the DeLux, Legacy, Small Batch, and Special Blend. The bottle is an elegant and authoritative, heavy square glass rectangular cube, which confidently signals that the contents command respect. Bottle Nose: Butter cream icing, vanilla, butterscotch, sugar cookie, nuts, dates, bananas foster and a good deal of old wood. Glass Nose: With a bit of water and time, we coax out similar aromas to the bottle nose, but more subdued. And if you wait long enough, you might even notice some bourbon-like oak and caramel. Palate: Butter cream icing, vanilla, butterscotch, honey, sugar cookie, lemon and wood. Other than the unmistakable signature Canadian taste, the Wiser’s 18 taste summary is that of sugary pastry. Add a bit of water to round the peppery edge and lower the calorie rush. Finish: Amazing smooth and balanced, medium finish, with a lip-smacking and slightly peppery, satisfying sweetness, followed by some cleansing and lingering orange and grapefruit rind. Conclusion: Wiser’s 18 is sometimes almost cloying sweet, but never like a liqueur or a honey whiskey … but I am not at all complaining … after all, how many whiskies can claim this glorious amount of balanced sweetness !? IMO, there are not many top-shelf Canadian whiskies, but if you are serious about whiskey, you might as well include one of the best Canadians in your collection. Wiser’s 18 would be a perfect top-shelf change of pace to your favorite lighter Irish whiskey or Speyside malt … especially for those relaxing summer months. Sweet review AboutChoice. I too have a fondness for this "top shelf" Canadian whisky. It is reasonably priced ($55 Ontario). I have become enamored with the younger sibling - Wiser's Legacy. Legacy is presented in the same square-shouldered bottle. No hints of neutral bases or "brown vodka" in this younger offering, it is a "rye whisky" and 45% abv. By far my favorite Canadian. At $85 (per 750 ml in Ontario) you won't be buying it by the case, but a bargain when compared to Wiser's Red Letter 150th Anniversary ($150 Ontario - worthy of the title, yet overpriced). Legacy is for sipping only - more pepper and spice than the other Wiser's. I was weaned on Seagram's Waterloo whiskies, but Wiser's has managed to win me over. A very nice whisky i've onlytasetd on one occasion. I would give this to anyne who only mixes to pull them over to the "sipping" side. Sadly I believe my cousin is a rum fan so the rest of it was probably mixed by his friends.... what a shame.. Damn good stuff for a reasonable price.